Rice rava idli is completely a different variety breakfast. 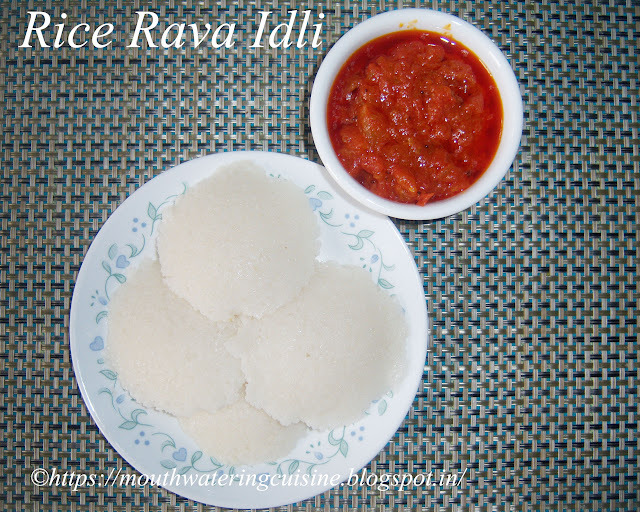 Rice rava is different from idli rava, do not misunderstand between these two. Rice rava is more coarse than the actual idli rava. We can find the granules in rice rava. We cannot substitute it with idli rava to make normal idlis and vice versa. We get nice rice rava available in the stores, which we can use without any cleaning or we can make it at home also. I normally use only store bought. We can make upma with it and uppu pindi also. Idli making is itself easy and simple if we have the batter ready. But for this idlis we need not have readily available batter also. We just need to plan a day before making it. I got this recipe from one of my neighbourhood friend. She taught me to mix the ingredients and make idlis, but I soaked them overnight and made. They are nice and tasty with little sourness from the buttermilk. Soak poha or flattened rice in one cup of buttermilk for ten minutes. Mix this with a ladle to make smooth paste out of it. Add rice rava to it. Add remaining buttermilk and mix well. Add salt and allow this to soak overnight. If we have to make it for evening snacks, we can do this in the morning and soak it for four to five hours. The batter should be like that of idli. Mix well before making idlis, if the batter thickens add little water to make it loose. Grease idli molds with little oil, pour a ladle full of batter into it. Put these idli plates in the pressure cooker or in the idli steamer and steam them for 10 to 15 minutes. 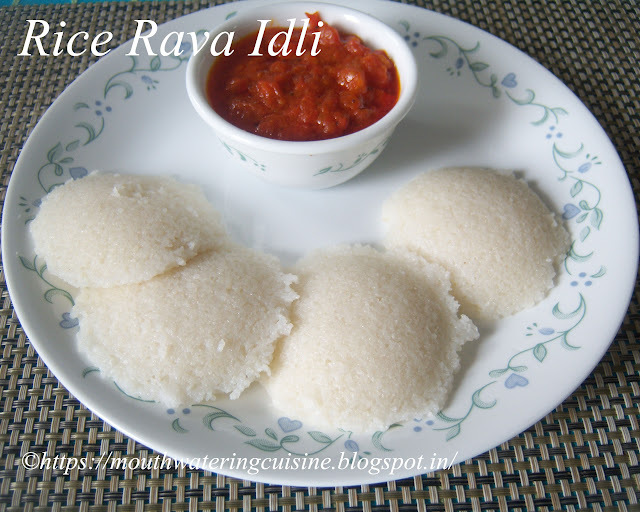 Serve soft and smooth rice rava idli with any spicy chutney. I served them with tomato pickle. For more breakfast recipes click here.Thank you visiting my blog. Hope you liked all my recipes. Any feedback and comments are appreciated.